Just because you don't know how to stain a deck doesn't mean you can't do the job! If your deck is in need of some repair, or you just want to enhance its appearance, this is one home improvement job that you can do even if you don't have any experience! Let's face it. Owning a home means always finding those little jobs that must be done to keep your home looking its best. Some of these jobs should probably be done by professionals, but others can be tackled by homeowners with little or no experience. Learning how to stain a deck is one such job that virtually anyone can do, and so can you! As with many jobs, the preparation is often as important as the actual job itself. The same holds true for staining a deck. Whether you are staining a new deck or refinishing an existing one, there are certain steps you must take to prep the deck before you can begin. Sweep: Obviously, you may not be able to get a deck completely free of dirt and debris, but you should try to sweep it as clean as possible. Clean: For older decks especially, it is important to remove any mold and mildew by using a deck cleaner. Depending upon the brand you choose, you may need to mix the deck wash or cleaner with water. Clean the deck according to the directions on the mix. You'll need to sweep the deck again after the wood has completely dried. Pressure Wash: To remove old stain, you can use a stain/paint remover, but this requires a lot of elbow grease and time. One of the best ways to remove old stain and rotted wood is to use a pressure washer. You can typically rent one of these by the hour or by the day. Before you turn the pressure washer on your deck, practice on some scrap wood. You can adjust the pressure accordingly. You'll want to sweep the hose across the wood. Don't spend too much time on any one part, or you'll find that the extreme pressure of the water will gouge the wood, leaving an uneven surface. Allow the wood to dry completely before moving on to the next step. Once you've removed all of the old stain, dirt, and debris from the deck, it's time to apply the stain. Because your deck will endure all types of weather, it's important that you choose a stain that offers some protection for your wood. Many stains include polyurethane that seals the wood against the elements. Visit your local hardware store and choose a stain color that suits your home's décor and includes a weather sealant as well. 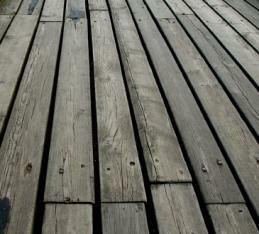 Choose a method: Opinions differ on how to stain a deck. Some people swear by the brush method, while others prefer the more modernized paint sprayer. Either method will work. However, a sprayer will work better for any rails and lattice trim you may have around your deck. For the deck floor, you may want to choose an electric floor brush that actually dispenses the stain as you sweep the brush across the floor. You can also paint the stain onto the deck using a mop-like brush that you dip into the stain and then apply to the floor. Clean up as you go: No matter which method you choose, keep several extra brushes and/or rags handy to mop up spills and drips as you work. If you have rails or a lattice, paint those first, wiping up any drips as you go. Once you've finished the sides of the deck, it's time to work on the floor. Begin at one corner, and work your way across the deck. Allow yourself plenty of daylight to work with, and work on a sunny, warm day to ensure fast drying time. Allow for drying time: Once you've finished the entire deck, wait 24 hours and apply a second coat if desired. Be sure to block off the deck from pets and people until the stain has completely dried, and don't put any deck furniture on the deck for another 24 hours to allow the stain to set completely.